There are few things more satisfying than seeing skilled people going about their work in a professional manner. A new touring version of Yasmina Reza’s hugely acclaimed play Art offers theatregoers in Sheffield a chance to do that this week. At the heart of the briskly-told comedy (the production lasts just 90 minutes and has no interval) is a painting. Many moons ago, Alfred Hitchcock described an object that sets a story in motion as a MacGuffin, and this all-white offering is Art’s. It brings together friends Serge, Marc and Yvan – and threatens to tear them apart. Serge is a dermatologist who has just spent 200,000 francs on the painting, a large canvas covered in textured white paint. He regards it as a masterpiece, but when Marc sees it, he is less than flattering, causing tension between the two men – while Serge thinks Marc is a philistine, Marc thinks Serge has lost all sense and is being pretentious. Yvan, meanwhile, is eager to please both of them. He has various personal problems to deal with and finds solace in their friendship. However, his inability to express his true opinion to either man sets in motion a series of arguments that become increasingly and disturbingly personal. 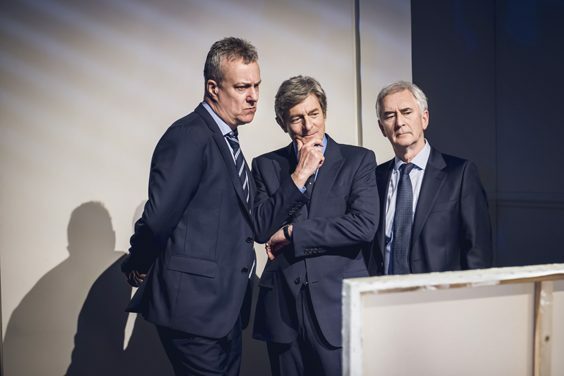 Many actors have taken the lead roles in productions across the globe, but few can have been as accomplished as the trio on display here – Nigel Havers, Denis Lawson and Stephen Tompkinson. Havers gives the impression of being able to carry off any role by using his innate charm, and he certainly relies on it here to make the potentially snobby Serge a sympathetic and well-rounded character. 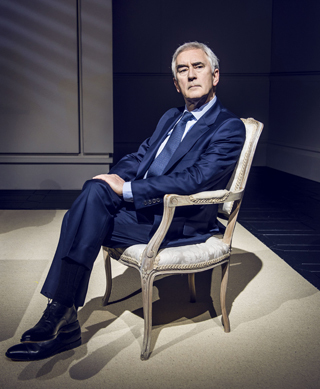 Lawson has rarely delivered a wrong note in his decades of screen and stage work, and he’s excellent too, as the pompous Marc. Lawson is also the shortest member of the cast, which adds another element to his performance – is there a hint of little man’s disease here, as Marc pours scorn on Serge’s gift to himself in an attempt to show his superiority? As good as Havers and Lawson are, they don’t outshine Stephen Tompkinson as Yvan. It’s true that he has the ‘showiest’ role out of the lot of them, but that could easily backfire – one false move or note and the entire production could collapse. Seeing him deliver both sides of an argument his character has had with his mother over the phone is a tour de force and worth the ticket money alone. Reza’s tale paints a portrait of the tensions within male friendships, and it looks set to remain a masterpiece for decades to come.